Facebook Offline Conversions enables offline event tracking, so marketers can run campaigns, upload transaction data, and compare in-store transactions. This document was last updated on April 24, 2018. If you notice any gaps, outdated information or simply want to leave some feedback to help us improve our documentation, please let us know! 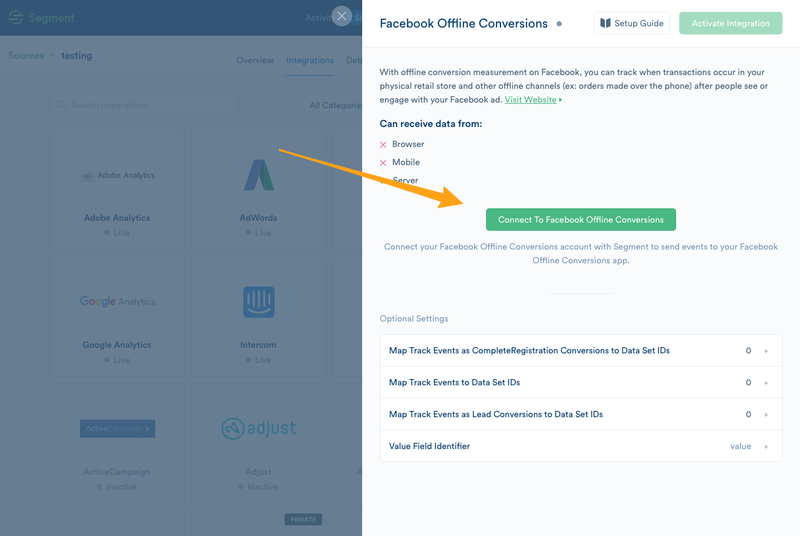 The first step is to make sure Facebook Offline Conversions supports the source type and connection mode you’ve chosen to implement. You can learn more about what dictates the connection modes we support here. Search for “Facebook Offline Conversions” within the Destinations Catalog and confirm the Source you’d like to connect to. By doing so, we will ask for ads_management and public_profile access scopes which will allow Segment to have proper permissions to send offline events to your Event Sets. You can read more about Facebook’s access and authentication if you would like to know exactly what these scopes allow. IMPORTANT: Note that the Segment user that is OAuthing MUST have admin access in your company’s Facebook Business Manager account. Otherwise, the authorization will fail. Once you complete the OAuth flow, you should be connected. Note: Once we retrieve your access token, they should not expire. However, if for whatever reason you are not seeing conversions come through you should check your destination settings and you should reauthorize. 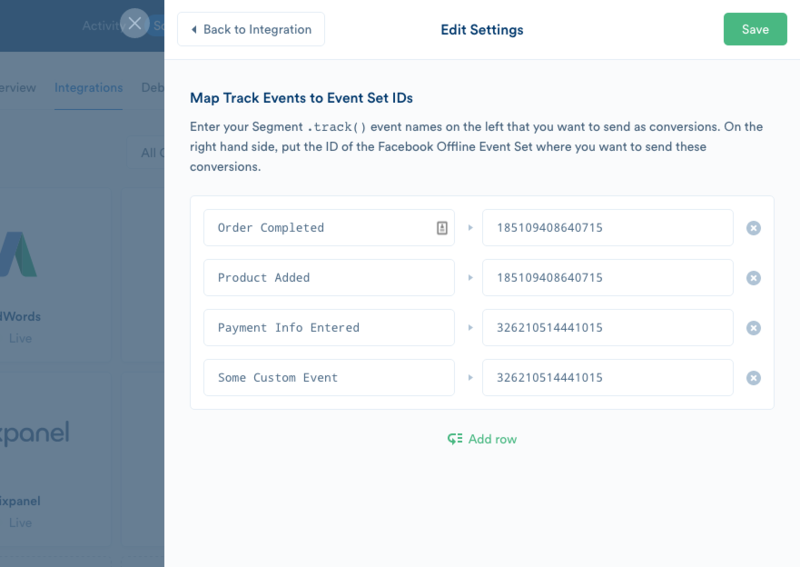 You MUST map the name of every Segment track event that you’d like to send and the corresponding ID of the Event Set where you want to send the conversions to. This is to avoid sending unwanted track events as conversions. Note: Lead and CompleteRegistration events can be mapped separately in Map Track Events as Lead Conversions to Event Set IDs and Map Track Events as CompleteRegistration Conversions to Event Set IDs destination settings respectively. Note: For only Product List Viewed will we set the content_type as "product_group" and use properties.category for the content_ids. All other applicable events will use properties.$.product_id(s) and "product" respectively. Any pre-purchase events will default to map Facebook’s value parameter to Segment’s properties.value. You can override this by choosing "price" in the Value Field Identifier dropdown in your settings. Order Completed events will always use properties.revenue. Facebook requires that you send at least one match_key in order for them to attribute which Facebook user should be tied to a conversion. The more user information you send with your track calls, the better the accuracy of Facebook’s attribution. Once Facebook has successfully attributed a conversion for a given user, they will store the mapping between the userId to the rest of match_keys such as the email address for all future conversions. We will use SHA256 to hash all match_keys that include personally identifiable data in compliance with Facebook’s privacy requirements. Keep in mind that Facebook’s furthest possible attribution window is 28 days. It is recommended that you send your server side track conversions within 62 days of the offline conversion occuring.